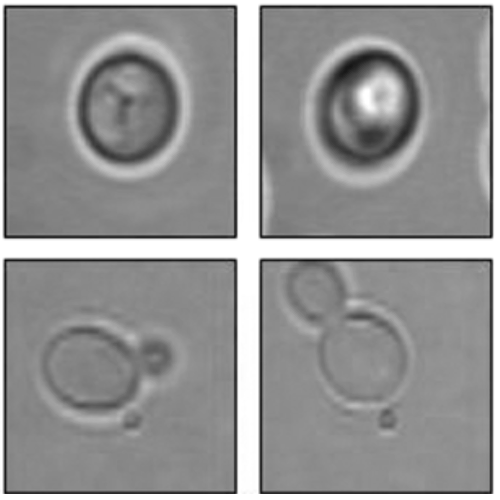 Monitoring Yeast Cell Growth Using Raman published in J. Raman Spectrosc. We optically trapped a single yeast cell for up to 3 h and monitored the changes in the Raman spectra during the lag phase of its growth and the G1 phase of its cell cycle. A non‐budding cell (corresponding either to the G0 or G1 phase) was chosen for each experiment. During the lag phase, the cell synthesises new proteins and lipids and the observed behaviour of the peaks corresponding to these constituents as well as those of RNA served as a sensitive indicator of the adaptation of the cell to its changed environment. Temporal behaviour of the Raman peaks observed was different in the lag phase as compared to the late lag phase. Two different laser wavelengths were applied to study the effect of long‐term optical trapping on the living cells. Yeast cells killed either by boiling or by a chemical protocol were also trapped for a long time in a single beam optical trap to understand the effect of optical trapping on the behaviour of observed Raman peaks. The changes observed in the Raman spectra of a trapped yeast cell in the late G1 phase or the beginning of S phase corresponded to the growth of a bud. Posted on March 3, 2006 June 8, 2018 Author adminCategories ArticleTags Caitriona M. Creely, Dmitri Petrov, Gajendra P. Singh, Giovanni Volpe, Helga Grötsch, Isabel M. GeliLeave a comment on Monitoring Yeast Cell Growth Using Raman published in J. Raman Spectrosc.